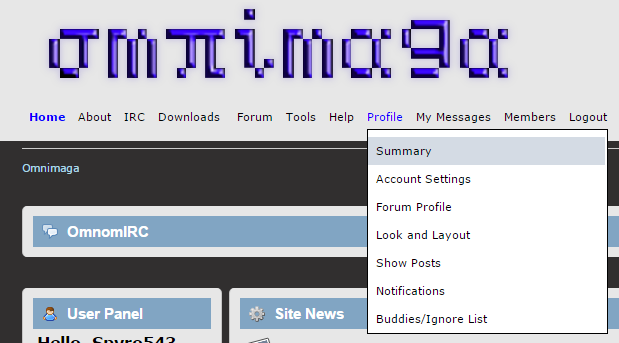 This is the first part of a series on how to use the Omnimaga forums. To see your profile on Omnimaga, hover over "Profile" on the header and click on "Summary". This will show you your public profile. I can't show the whole page in one picture, so I'll just explain what all of the fields are for in multiple screenshots. The screenshots are put into quotes for readability. Personalized Picture: Also known as your avatar. This picture shows up beside all of your posts. Select "No avatar" to not have an avatar, "Specify avatar by URL" to use a picture on the internet as your avatar, and "Upload an avatar" to use a picture on your computer as your avatar. Personal Text: This is text that you can customize that also shows up beside all of your posts and in your profile. It is optional. Birthdate, Location, Gender: These fields are optional. You can provide your birthdate (other people will be able to see your age on your profile), your location (doesn't have to be detailed, visible on your profile), and your gender (also visible on your profile). 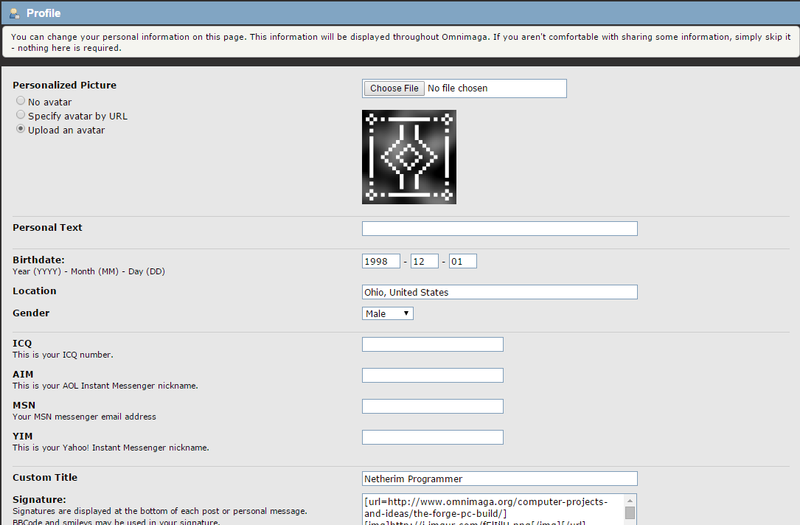 ICQ, AIM, MSN, YIM Usernames: These fields are optional. You can show your username for various IM services on your profile. Custom Title: This is optional. This is text that you can customize that shows up below your username on all of your posts. You need to have 1000 posts to be able to use this feature. Signature: This is optional. A signature is like a little post that shows up below all of the posts that you make. It can have text and any kind of BBcode you want in it, as long as it is not more than 200 pixels tall. Website: If you own a website, you can put its URL here. This shows up on your profile and is optional. Calculators: List any calculators (graphing or otherwise) that you own here! This is optional. Social Networks: If you want to put links to your social network accounts on your profile, enter them here. This is optional. That's it! 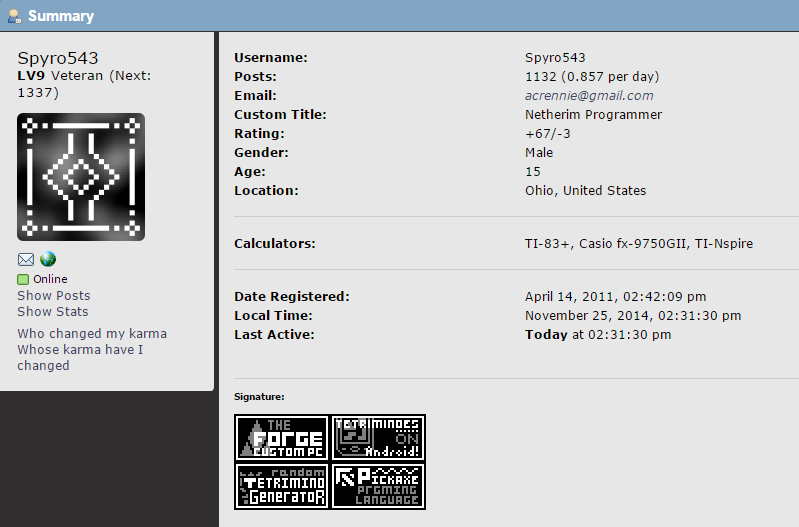 Be sure to click the "Change profile" button on the bottom of the page to save your changes. I like this. You'd have to literally be brain dead not to understand these instructions. But in order for it to be of any use, I'd say it should be incorporated into something that all new users automatically see. Yeah I was gonna point out that the Omnimaga forum install already has help by default. But it definitively misses stuff that got added via mods and perhaps there are unclear things, so I guess it won't hurt to give more info or make things more clear. I didn't know about that. I guess I'll keep making these though. Why not? Very helpful... found this out the hard way! You should make a tutorial on using the search function if the current one isn't very clear. I sometimes noticed that people complain about the search engine not finding results, but the issue is that the quick search box on every page will only return results from the thread or sub-forum you're currently viewing, not the entire site.